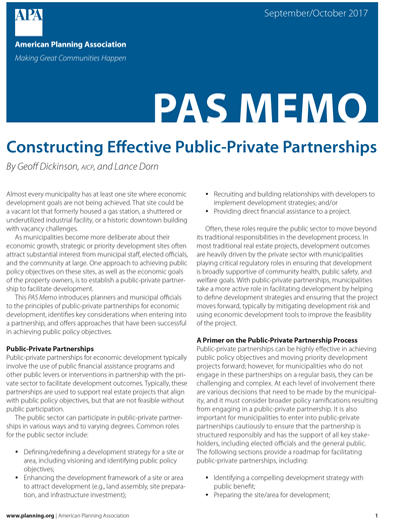 The September/October 2017 issue of PAS Memo introduces planners and municipal officials to the principles of public-private partnerships for economic development, identifies key considerations when entering into a partnership, and offers approaches that have been successful in achieving public policy objectives. Geoffrey Dickinson, AICP is a real estate and economic development advisor at S.B. Friedman, Development Advisors in Chicago. His expertise spans market and financial feasibility analysis, development strategy, public-private partnerships, special district establishment, public finance, public policy and urban planning issues. Geoffrey’s work in real estate development strategy and project implementation includes consulting for the the University of Nebraska-Kearney’s campus expansion and for the University of Illinois at Chicago (UIC) on a broad range of pro forma, feasibility, and financing strategies. His expertise in market feasibility analyses has focused on the Midwest region, with contributions to economic development and market analysis in Matteson, IL, Milwaukee, Iowa City, and Rock Island County, IL. Geoffrey holds a Master’s in Urban and Regional Planning from the University of Michigan and a Bachelor of Arts degree in History from Northwestern University. He is regularly published by the Illinois City and County Management Association (ILCMA) and has presented at ILCMA, APA national, APA Illinois, and APA Chicago Metro Section events, and at Illinois Tax Increment Association conferences.